I had also been hanging on to a lot of books and notebooks filled to the brim from my graduate days in our basement even though I was no longer interested in continuing to pursue my Ph.D. or teaching. In looking through the notebooks and papers I had written, I remembered all the good times I had enjoyed while working on my degree. I had already put the bad times behind me and had chosen to forgive so getting rid of this stuff was the final thing I needed to do to let go. I kept my thesis work and a few writing samples and that was it. Upstairs, I kept sheet music, poetry I wrote, an art journal, Christian literature, my art books and a few special books from my childhood that I will pass on to our son, Hayden. Every book I own is now in one, medium-sized, clear, plastic storage container in our laundry/computer room. Since I seldom use even these books it felt right to put the bookshelf down in storage for our son, as he gets a bit older. Our place looks so much better without all that surface-area clutter and requires much less dusting! I am putting together two 12 photo collages (one for pictures of my son, and one for family and friends) to go on the walls of the living and dining rooms and one 3 photo collage of our favorite wedding photos. 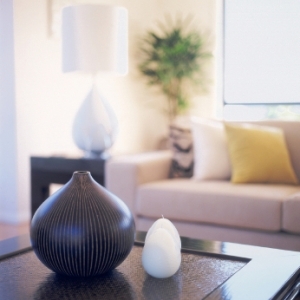 This will greatly simplify the rooms and visual space. I am also looking forward to be able to look at all the people that truly enhance my life without needing to search through a lot of clutter. Living simply for me also means not over committing my time, energy and money. I chose not to re-join a community choir because the rehearsal time is very inconvenient and I would rather spend that time with my family. Since I am fortunate to have the material things I need, I avoid shopping, especially looking at certain “trigger” sites online (something I used to really enjoy doing). That has been a hard thing for me to change but it saves money for our family and creates more time, which is better spent elsewhere. Through my efforts to de-clutter and simplify, my husband was inspired to help me by pulling my stuff out of storage so I could go through it. As the chef of the house, he also went through all the kitchen gadgets and utensils. He even agreed with me to go paperless, as much as possible, with our files. My mom was inspired to go through her dreaded hall closet getting rid of many, many things. Although my husband still feels that there is no way that he would ever want to live in a tiny house, my decision and efforts to simplify have made a lot of progress for all of us. With appreciation for Dawn Zimmerman’s post to www.TinyHouseBuild.org, here’s the second of three parts how one person decluttered their life. As I was going through my knick-knacks and the like, I also went through my decent sized “collection” of art supplies. I had some top notch water color pencils I hadn’t even opened. 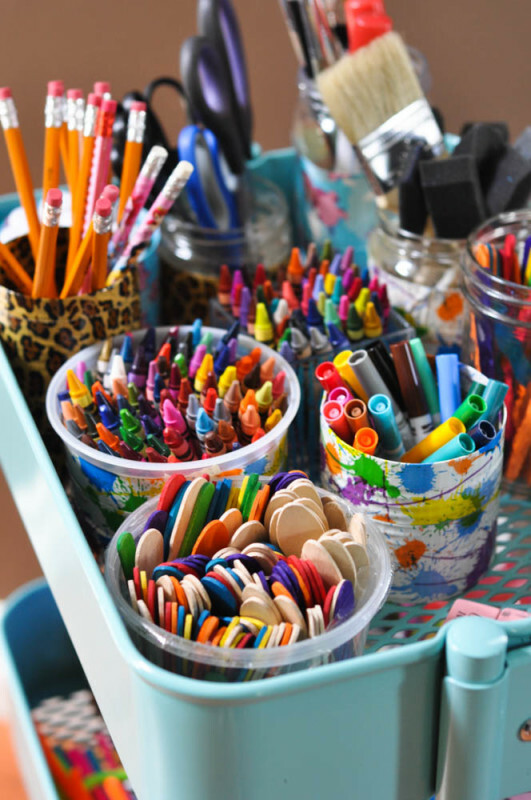 Paints, drawing pencils, and the like were filling up a tall dresser. Beautiful materials I hadn’t used in over 10 years! I had even collected various other materials that were to be used for mixed media and sculpture pieces in a future that never happened, and wouldn’t happen. I realized as cool as it would be to create those pieces, I had lost interest in making them. I donated all the pill bottles I had been saving over the years to make a sculpture to some missionaries in the D. R. Congo that our church supports. They needed them because the hospital had nothing to put their patients’ medicine in. It amazed me that something so seemingly useless could make such a big difference for someone. I only kept the supplies I had used here and there over the years. I gave away old artwork that I never looked at anymore to friends who liked the pieces for their walls. One art piece was donated. Both my easels went. It felt good. I even donated the old dresser that had held these art supplies as well as my childhood clothes, and even my dad’s stuff from when he was a boy. Now that dresser will hold someone else’s things and that makes me smile. I cannot tell you how much of a blessing it has been for me to give these things away to folks that will actually use it. When you think about it, for all those years, that tall dresser was storing up someone else’s opportunity to work toward their dreams. I now have most of my art things in two sets of small, plastic, three-drawer storage “dressers” that I already had on hand. You may start to notice that as Dawn class out all the excess, her spirit and mental state begin to change as well. There are so many benefits to finding a class, hiring a coach, joining a like minded group. Don’t let your own excess stop you – there is help. If you’re wondering just what the best course is for you, drop me a line. I was particularly drawn to the idea that de-cluttering your stuff and your life helps to de-clutter your mind. Boy, does that sound good! It seemed like it might help and it certainly couldn’t hurt. I thought that I would start with my clothes, but what I actually started with was accepting my present size. After many years of defining myself, in some ways, by my weight I have come to a point where I am happy to be me as I am. 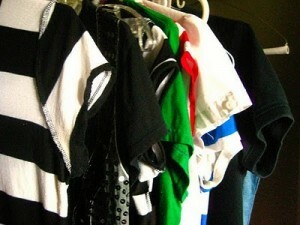 This process allowed me to let go of my old clothes. Previously I had numerous storage containers of smaller clothing, even underwear, (really??) in my closet and in storage (as if keeping them around would somehow change things). I don’t need them anymore so they went bye, bye! I even donated my vintage dresses that I had longed to fit into again. A couple years ago giving them away would have been unthinkable. Now I have about 10 days of clothes for cold weather and 10 days for spring, summer, and fall combined. Keeping a handful of cardigans works well through all the seasons. I do have a few “inspiration” clothes that are smaller and a few bigger maternity items in case I need them, but everything else fits. The next task to conquer was decorations and knick-knacks. I am lucky in the fact that my husband doesn’t have a lot of personal possessions, mostly shared ones. When I told him I wanted to donate my personal stuff that I no longer used he was, for the most part, delighted. He had never understood why on earth I had so much crap to begin with. Getting rid of some of this stuff was easy, but certainly not all of it. I had suspected, but never really knew, the depth of emotions that some of these items invoked for me. Each gift reminded me of the giver on an emotional level, even if the item was no longer needed or wanted. I also realized that there were a few items that I had been holding on to in an effort to save that part of my past, refusing to let it go. Determined to live in the here and now I took photos of some of the things that I thought I had cherished (but were really holding me back) along with a few other sentimental items and let them go. I kept some things, but I let the past go. Perhaps I will never look at these photos; who knows. The important thing is that I made a commitment to live in the present. I regularly teach an incredibly effective way to declutter your life. This story will be continued, but IF you are serious and would like to become part of a tribe who’s purpose is to declutter their lives, email me and let’s see what miracles can happen. Info at creative-visions.co. Put Declutter my life in the subject line.